Worshiping Sri N ama Prabhu with devotees is the most inspiring thing in the world. When the focus is service to the Supreme Person, the level of spiritual energy runs high as sincere practitioners strain to serve the transcendental sound vibration with their ears whilst hoping He will invade undeserving hearts with love for His own Name. Radha Gopinath Mandir and Iskcon Juhu in Mumbai were such places. Furthermore, we spent a couple of nights in the Goverdhana Eco Village in Vara, a project some 2 hours drive from Mumbai. It is complete with the 7 temples of Vrindavana and all the pastime places of Vraj. Even arotik to the Yamuna happens every evening. Radhanatha swami is the force behind this replica Vrindavana. In the courtyard of Radha Damodara temple, he tells us the project is not meant to replace Vrindavana, but to create separation. Here the atmosphere is pristine in the morning, the goshalla houses hundreds of cows, the monkeys live in the hills because no one encroaches upon their living space, electric golf carts are the only means of transportation on the compound and there are hundreds of trees, flowers and birds everywhere. A Krishna pastime is literally behind every tree. If we are lucky to attract the mercy of the Mumbai devotees, they will engage us again next year. 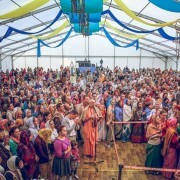 A number of devotees again attended the Ukraine festival this year. The grounds are near a lake surrounded by pine forests. As usual, seminars are offered during the day. 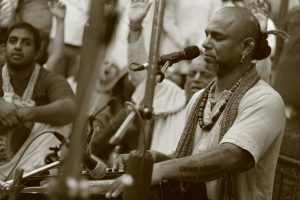 A special non-stop kirtan tent was added this year. There, we serve Sri Nama Prabhu 3 hours every day, besides the occasional kirtan in the evening in the big tent. We are happy to be so engaged. About 45 minutes before my time was up today, Radhika spoke for nearly 15 minutes on Nama Tattva. We then chanted without instruments for the rest of our allotted time. That was a challenge! 45 minutes of pure Maha Mantra and our minds!!! No instruments to distract or entertain us!!! Many devotees left. The few who stayed on really worked on uncovering our eternal bond with Pure Spirit. 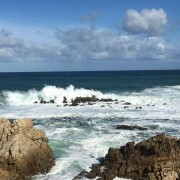 Pringle Bay is the home of Mukunda, his wife Madhurika and their 2 sons. They always graciously invite us for some R&R. This time, however, both Radhika and I were very sick with a brutal cold. We spent our entire stay recovering. Still, the Stellenbosch devotees had planned a 2-day kirtan retreat with university students. We all congregated in Mukunda’s temple room. It is spacious and the view of the crashing waves through the large French windows is stunning. The students’ loud and enthusiastic chanting was deeply inspiring and naturally led to spontaneous dancing. Before leaving the Lord of The Seas gave us a bonus. We spotted a large dark mass gliding quite close to the rocks. We saw it blow 3 times. Finally the whale turned seawards and dove, bringing its massive tail out of the water. Kirtan with the students was so encouraging that we hope to be so engaged next time. Israel is starting to feel like family now – many familiar faces that we meet in the dhama every year are here. Both programs organized in 2 different cities were well attended. Newcomers formed a big percentage of the crowd. Everyone present chanted earnestly. The Hari Nama was the best. May be being the yuga dharma, Sri Nama Prabhu is exceptionally lenient and He easily reciprocates. Many non-devotees participated by dancing. 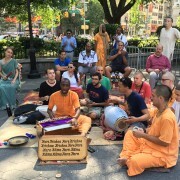 Sitting down opposite one of the entrance to the Union Square subway stations to chant Hare Krishna is sublime. Lots of times people just rush by hardly acknowledging us, it seems. Still, the nature of sound is that it penetrates and acts subconsciously and this chanting is the first transcendental trickle reviving the creeper of eternal love and devotion present in all living beings, not just humans. We watch the devotees passing out spiritual books and while some eagerly accept, others need convincing and yet others decline. But of those who are walking past, who can escape the transcendental sound? Good fortune has arisen for them and us too, who are taking part in Hari Nama Sankirtana. We know Krishna is the Controller, still our humble, insignificant plea – Allow us to be an active part of Sri Hari Nama till our very end. To the best of my ability and with the most sincere of my intentions, this blog is meant to broadcast the glories of Sri Hari Nama Prabhu. In the months of February to April we journeyed to Bali, Australia and New Zealand. In each country we traveled to different cities to serve Hari Nama Prabhu. 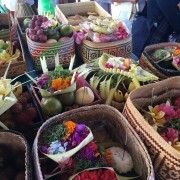 Bali, the land of ancient temples, is full of eager devotees. 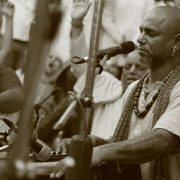 Kirtan is natural to them. We hope they will engage us again in the future. Perth is like coming home for us. The house where we always stay is not far from a park where one can come across hopping kangaroos in the early mornings. The company of Jaggatarini mataji and Bhurijana prabhu are of course, precious. Radhika even did an Ekadashi cooking course, which was well attended; and now she is definitely inspired to do more. The rest of Australia was intense. Since the first kirtans we did in Oz, the mood of the devotees has improved to ‘focus and earnest’. A good number of them engage in Hari Nama regularly and an even greater number attend the Hari Nama seva festivals. Oz has a story of outstanding Hare Krishna restaurants. People queue up to sample palatable prasadam. So did we. We came to Christchurch, NZ for the first time. Since the temple was destroyed in the last earthquake every devotee house is a temple. They are all committed to a regular program, which they hold at each other’s house. Chanting Hare Krishna amongst fewer is intimate and forces us to be attentive. Devotees in Auckland are old acquaintances, even from my days in Vrindavan in the early 90’s. There is so much to say about all these places. This is just a summary. This blog can be more personal if I am fortunate to be so engaged next year. We are in NY at the Hari Nama house. Preaching is going strong and a number of enthusiastic newcomers happily go about, eager for service. Everyday Sri Hari Nama reciprocates in a different way. Sankirtan legend, Adikarta prabhu, gave an inspiring class this morning. Sober and humble Bada Hari prabhu is staying in the house too. Manoram, leader of the bus tour is also a temporary resident while the younger boys under him have fled to Brooklyn temple due to the austere living conditions of the HH.